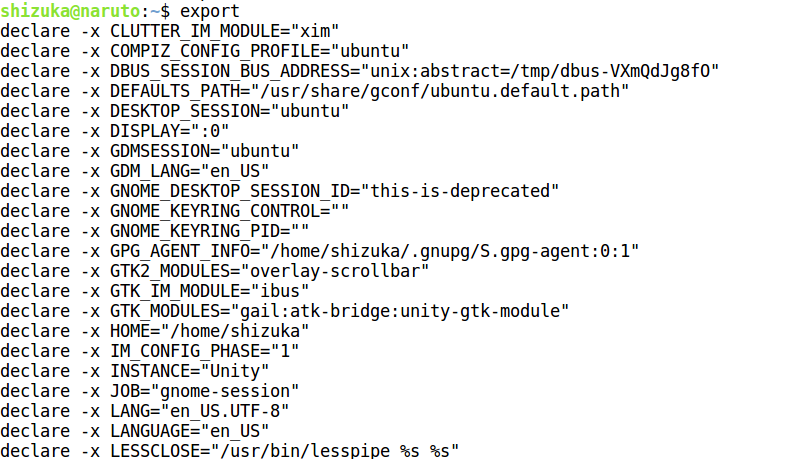 export is bash shell BUILTINS commands, which means it is part of the shell. It marks an environment variables to be exported to child-processes. Export is defined in POSIX as: The shell shall give the export attribute to the variables corresponding to the specified names, which shall cause them to be in the environment of subsequently executed commands. If the name of a variable is followed by = word, then the value of that variable shall be set to word. In simple terms, environment variables are set when you open a new shell session. at any time if you change any of the variable values, the shell has no way of picking that change. The export command on the other hand provides the ability to update the current shell session about the change you made to the exported variable. You don’t have to wait until new shell session to use the value of the variable you changed. 1. Without any argument : To view all the exported variables. 2. -p : To view all exported variables on current shell. 3. -f: It must be used if the names refer to functions. If -f is not used, export will assume the names are variables. Note: Bash command is used for showing that in the child shell, the shell function got exported. 4. name[=value]: You can assign value before exporting using the following syntax. Note: No output will be seen on screen, to see exported variable grep from exported ones is used. 5. -n: Named variables (or functions, with -f) will no longer be exported.